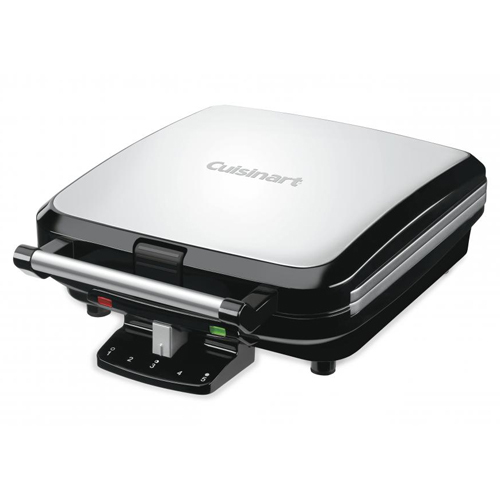 The Cuisinart WAF-150 is a belgian waffle maker that makes delicious breakfast and waffle. It has an elegant stainless steel top for reliable, high-performance waffle iron. Its nonstick baking plates easily releases the complete waffles and cleans up easily. A powerpreheat lights indicator is provided to know that waffles are ready. It's deep-pocket waffles holds more toppings for more delicious options. The waffle maker comes with five-setting controls that create customized results to meet all tastes. The 4-Slice Belgian Waffle Maker has many exciting features for users of all types. You can extend the lifetime of your 4-Slice Belgian Waffle Maker with the purchase of a FactoryOutletStore Factory Protection Plan. See the 4-Slice Belgian Waffle Maker product video and gallery images above for more details. The 4-Slice Belgian Waffle Maker is sold as a Brand New Unopened Item.